Snow shovels were in the hands of Marion Local football players Tuesday as they cleared off Wapakoneta's Harmon Field for practice. The Flyers hope to have a trophy in their hands Friday. Marion Local-Kirtland Round 3 happens at 10 a.m. at Tom Benson Hall of Fame in Canton. It's the third time in four years the programs have met in the Division VI state championship game. The Flyers and Hornets have each won a game in the series. Marion Local's Nathan Ungruhn (84) and Darrin Hays (44) tackle Coldwater quarterback Jake Hemmelgarn during the regional final in Sidney. "We're going to have to score points," Flyer coach Tim Goodwin said. "We just look at their offense, and to me, it's all about the matchup - what they do well versus our strengths and weaknesses. They're going to move the ball and they're going score some points. Our defense is going to play hard and they're going to fight like crazy. But we're going to have to score points to win this game. We're going to have to be efficient." Marion Local, which defeated Kirtland 34-11 in 2017, is in the title game for an eighth consecutive year and can tie Cleveland St. Ignatius for the OHSAA all-time title mark with its 11th championship. Kirtland is making its seventh state championship appearance in eight years. The Hornets are looking to win their fourth crown and first since beating the Flyers 22-20 in the 2015 game. "They've won 10 championships, and they're really well coached by coach Goodwin and his staff," Kirtland coach Tiger LaVerde said. "Those kids play hard. They're very physical. Last year, they beat us pretty good, and our kids remember that." The Hornets have matched up against Midwest Athletic Conference opponents for state titles several times before. They beat Coldwater 28-7 in the 2011 Division V game, lost to Coldwater 10-9 in the 2012 D-V game and then two years later, they lost to Minster 46-42 in the D-VI game. "I'm very jealous of that conference out there, because on Friday night's there's so many great games, so many good schools, so many good coaches and it's a great conference," LaVerde said. "Every year but once that we've made it, we've ran into a MAC school, and it's fun. Good people and good competition." Kirtland (14-0) finished the regular season ranked No. 1 in the Associated Press Division VI poll and advanced to the championship with a 35-18 victory over Beverly Fort Frye last week. The Hornets' ground game has been their bread and butter offensively, with two running backs amassing more than 1,000 yards in Joey Torok and Jake Neibecker, both starters last year. Torok has a team-leading 1,728 yards rushing on 128 carries and 28 touchdowns to go along with 11 catches for 311 yards and six scores. Neibecker has added 1,116 yards and 14 scores. Quarterback Tommy Powers has been effective through the air when called upon. He has completed 52-of-77 passes for 1,010 yards with 13 touchdowns and two interceptions. Powers also has seven rushing touchdowns and is coming off one of his best rushing efforts of the season - finishing with seven carries for 121 yards and two scores in last week's win over Fort Frye. The Flyers (13-1) finished the regular season ranked third in the AP poll. The defense is led by Division VI Defensive Player of the Year Sam Huelsman. They held opposition to single digits in six games during the regular season (including a shutout of Woodlan, Indiana). In the postseason, Marion has outscored opponents 162-49 and is coming off a 34-6 victory over Seneca East in the state semifinal. "Sam is obviously the leader of our defense," Goodwin said. "The kid started Day 1 as a sophomore, so that's a lot of games at this point. He's one of our bigger, physical guys that we have this year. Our team rallies around Sam, for sure. "Our offense is very veteran," Goodwin added. "We've got a lot of guys in skill positions who have played in a lot of games now. We have an offensive line that is all seniors. A lot of them didn't play until they were seniors, but they're still all seniors. For whatever reason, the way it worked out is we had some young kids playing defense. Those kids have really impressed me and have really grown a lot throughout the year. I like where our defense is at in terms of still getting better every week." Marion Local's Matthew Prueter (59) and Brandon Fleck (25) block for Nolan Habodasz (with ball) during a game this season. Nate Bruns is the signal-caller of the Marion offense for a second straight year. In last year's title game, Bruns completed 10-of-15 passes for 178 yards and two scores to Nick Tangeman, who accounted for 120 yards on six catches. Matt Rethman and Nolan Habodasz have also been dangerous at the skill positions for the Flyers and each had big games against Kirtland in 2017 as well. Kirtland has shut out opposition on seven occasions this season. The last two weeks marked the first time this season in which the Hornets allowed double digits (20-14 win over Mogadore and 35-18 victory over Fort Frye). But LaVerde noted that his team hasn't seen an offense as good or as balanced as Marion's this season. "We haven't seen a quarterback or a wideout, even two or three wideouts, like this," LaVerde said. "I don't think anybody we've played has been this dynamic offensively. They have unbelievable balance. A lot of teams come out in the spread and they throw the ball 40 times a game. A lot of teams go Wing-T and they're going to run the ball 90 percent of the time. This team has great balance. They're 50-50 run-pass." Snow shovels shouldn't be needed Friday - the Canton forecast is calling for a.m. showers with a temperature around 40 degrees. Also in the forecast that morning is a good football game. "It's the rubber match - they got us and we got them," Goodwin said. "I think it's going to be a great game. I think it's two pretty evenly matched teams with different strengths and different weaknesses. It's going to be interesting to see how those things play out." The Marion Local Flyers air show has been fun to watch and tough to ground this season. Nate Bruns has passed for 2,537 yards this season which is a new single-season record for Marion Local. On Friday, fans get one more chance to witness it when senior quarterback Nate Bruns pilots the Flyers into Canton with classmates/receivers Nick Tangeman and Matt Rethman also in the cockpit. In 20 years with the program, Marion Local coach Tim Goodwin has had some great offenses and great quarterbacks (Adam Bertke, Mitch Knapke, Chad Otte, Chris Stucke, Cory Luebke and Duane Leugers). This year's offense and quarterback rank up there with the best. Nick Tangeman has received of many of Nate Bruns' passes while Bruns set a new single-season passing yards record for Marion Local. "You have a high school quarterback who can make any throw that you could possibly ever draw up on a piece of paper," said Goodwin said of Bruns. "You don't get guys that come around like that very often. Anything is in play with that kid. The vast majority of high schools don't have that luxury and we typically don't have that luxury. We're just blessed to have that kind of kid pulling the trigger for us, and to have Nick Tangeman and Matt Rethman to throw the ball to, we're just fortunate." This season, Bruns, a 6-foot-6 Findlay basketball commit, surpassed Adam Bertke to become Marion Local's single-season passing yardage leader. Bruns has distanced himself by a good chunk of yardage from Bertke, a former Pittsburgh recruit who is now at Findlay. Entering Friday's contest with Kirtland, Bruns has 2,537 yards with a 61.1 completion percentage. In 2012, Bertke broke his previous record with 2,237 yards by completing 62.5 percent of his passes. Matt Rethman has received of many of Nate Bruns' passes while Bruns set a new single-season passing yards record for Marion Local. Bruns has experienced, speedy and reliable targets to rely on in Tangeman (6-foot-4, 175 pounds) and Rethman (5-11, 155). All three players were first team All-Midwest Athletic Conference selections (Rethman was selected at cornerback). Tangeman's 1,206 yards this year make him the all-time leader for a single season yards at Marion. His 53 catches tie him with Dylan Thobe (2011) for fourth most all-time. He has hauled in 17 of Bruns' 27 touchdown passes. Rethman, who has three TD catches and three rushing scores, ranks in Marion's top-10 with back-to-back seasons of 48 receptions. Marion Local's Brandon Fleck runs the ball as teammate Darrin Hays (44) looks for someone to block. The passing game is complimented by a dangerous rushing attack. The offense features first team All-MAC pick Nolan Habodasz, who is a threat to break off a big run at anytime and has a team-leading 21 touchdowns. Brandon Fleck has found success with 11 rushing TDs. The offensive line is senior laden and features three All-MAC selections in Reece Eifert, Derek Wilker and Eric Schlarman. Kirtland coach Tiger LaVerde got a firsthand glimpse of Marion Local's offense last year in a 34-11 loss. He raved about Marion's offense after the game and then again in Monday's state football teleconference. LaVerde knows it will be hard to slow down the Flyers Friday but said his team is excited for the challenge. "If I knew (the secret to stopping them), we would have stopped them last year," LaVerde said. "The quarterback does a great job of extending plays - he can run. He's a great passer, but he's so stinking elusive. Their guys up front do a good job protecting him. He buys time and then their wideouts find a way to get open. (Tangeman) is a hard matchup because he's 6-4 and fast and he's very talented. He has great ball skills. They just throw it up and he goes up and gets it. If you double him, then they just run the ball down your throat. (Rethman) is a heckuva a football player - I can tell you that. He's a matchup issue in himself. It'll be tough for our kids, but they're excited for the challenge." No. 3 Massillon Washington (14-0) vs. No. 1 Akron Hoban (14-0), 7:30 p.m.
No. 1 Kirtland (14-0) vs. No. 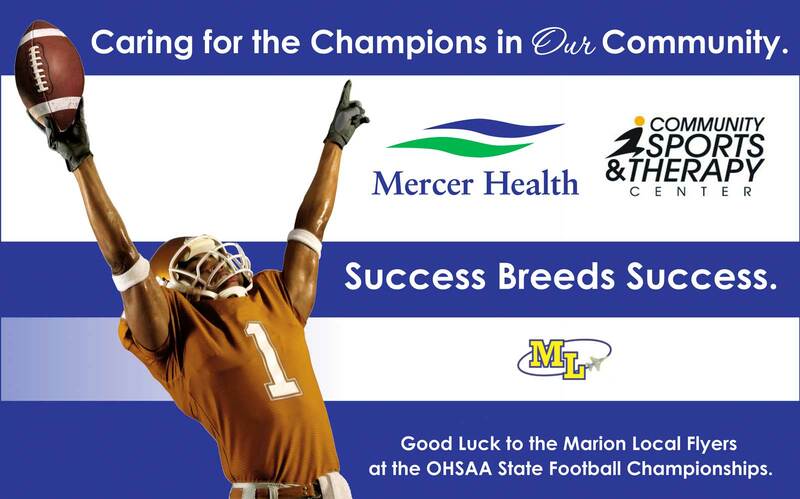 3 Marion Local (13-1), 10 a.m.
No. 1 Kettering Alter (13-1) vs. No. 4 Chagrin Falls Kenston (13-1), 3 p.m.
No. 9 Lakewood St. Edward (10-3) vs. No. 1 Colerain (14-0), 8 p.m.
No. 6 McComb (13-1) vs. No. 2 Glouster Trimble (13-1), 10 a.m.
Orrville (12-2) vs. No. 4 Johnstown-Monroe (13-1), 3 p.m.
No. 1 Wyoming (14-0) vs. Girard (13-1), 8 p.m.